Do Chimpanzees Have a Theory of Mind? Many animals communicate danger via alarm calls. But scientists have long known they make such calls automatically. If they sense something dangerous, they make the appropriate noise, regardless of whether their companions are aware of the danger or not. Being aware of what others know is something we’ve known is unique to humans. Or it was until this week, when researchers published an interesting study about chimpanzee cognition this week. 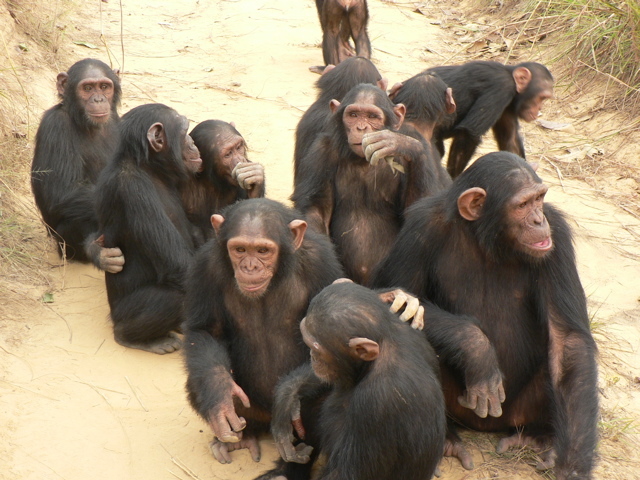 It suggests that chimps are in fact aware of whether other chimps know something or not. Moreover, chimps change their alarm calls based on their companions knowledge or ignorance. The researchers used snake mock-ups, since snakes elicit a strong fear reaction in chimpanzees. By placing the snake lookalikes on trails where chimps travel regularly, they could study the chimps’ alarm calls. In the first series of experiments, the researchers simply watched how the chimps reacted—most did so in ways familiar to humans. First, acting shocked as if struck by electricity, then calling out hoos to those nearby, warning them. They also motioned in the direction of the threat with their eyes. In the second series of experiments, the researchers played audio recordings that the chimps could hear just prior to them stumbling upon the fake snake—some of the recordings were of chimps making alarm calls while others were of chimps making normal at-rest hoos. In watching the chimps react on video, the researchers found that they would hoo much less actively after just hearing a warning hoo on tape versus an at-rest hoo. They were clearly associating the warning hoos on tape with another chimp having already seen the snake. Because of that, the chimps modified their reactions, hooing much less sharply. Apart from revising our knowledge of the cognitive abilities of primates, the scientists believe the study also tells us about ourselves. It might be too early to draw conclusions about language and other behaviors that, as far as we know, really are limited to humans from this study. But it does indicate that chimpanzees have some awareness of the mental states of other chimps. That’s consistent with them having a theory of mind, something suggested by other chimp behaviors (for example, their ability to comprehend false beliefs in others). By itself, this makes chimpanzees and humans even more alike than we believed. What think is special and unique about humans is, in fact, shared by our closest living relatives—something that ought to undercut the airs we give ourselves.